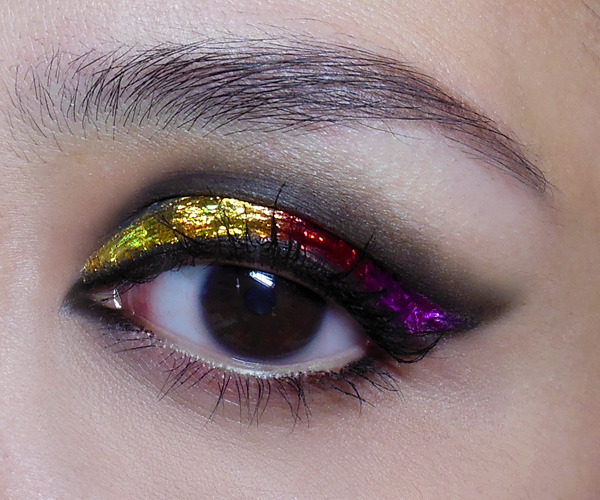 The Makeup Box: Holographia: Dramatic Foiled Ombre Lids (Yellow-red-pink) with Transfer Foil! Holographia: Dramatic Foiled Ombre Lids (Yellow-red-pink) with Transfer Foil! Transfer foils were created for arts and crafts. Then some genius decided to use it on nails. Not long after, some people thought it might be a good idea to attempt it on the lips. 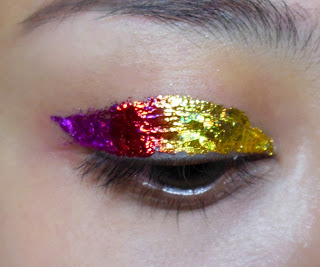 Since I've got tons of foil (I buy mine from dollarnailart.com), I naturally wondered about using it for other things. 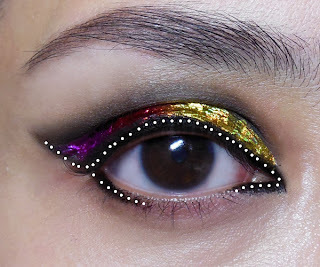 It is BRILLIANT as a dramatic transfer tattoo on the body, But what about the eyes? While there isn't anything harmful about applying the water-based nail foil adhesive onto your hands and body in general, applying it to the eye was another thing altogether. Because companies are so hush-hush about the ingredients of their glues, I could only guess at what ingredients Shizzle Lips and Glitzy Lips used in their "lip approved" skin-safe glues and whether they were mostly similar to nail foil glues. You only need to know that you can use lash adhesive (if you have a strong and thick formula like Duo, add a tiny drop of water to thin it out before applying with a brush or it will be too hard to spread nicely). It's the same thing no matter where you buy it from. These are layers of reflective or holographic ink that isn't toxic or reactive in their dry state. Whether you pay $1 at Dollarnailart.com or $29.90 for Glitzy Lips, it is EXACTLY THE SAME THING and they work the same way. The strip I chose was unfortunately part of a jumbo pack from eBay, which doesn't have a name or number. 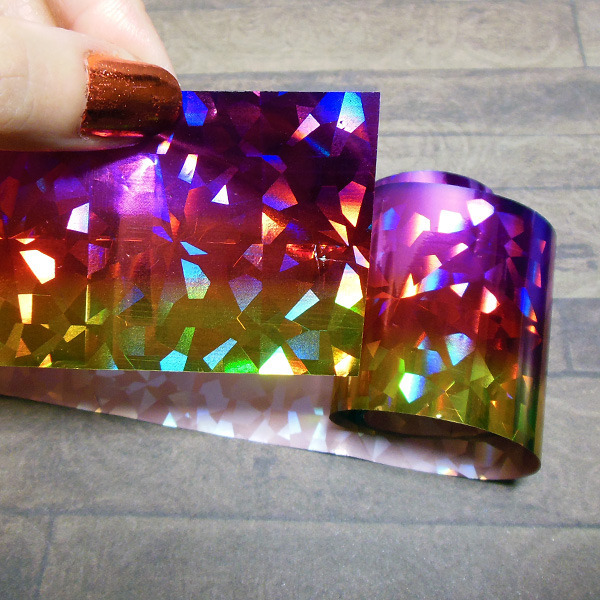 You can substitute any other color foil though I recommend a strip that has a similar ombre gradient if you want the same effect I got. At dollarnailart.com, a similar alternative would be Wrapping Paper or Wildberry Splash. Step 1: Start with very clean skin. No lotion, no makeup around the lid area or the glue and foil will not stick properly. 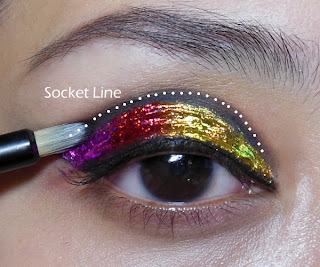 Apply a layer of glue evenly to your lid, like you would apply a thick swatch of liner. Let dry for 2-3 minutes, then go back in with a 2nd coat. Let dry another 2-3 minutes. This minimizes patchiness and will ensure you have a strong layer of glue that can grab onto the foil. 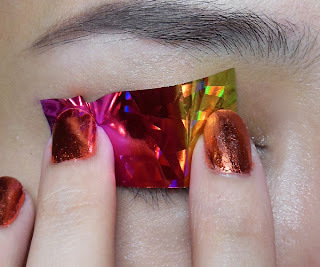 Step 2: Gently lay the foil over your lid (colorful/shiny side OUT, away from your skin) and rub gently but firmly witih your fingertip or the end of your brush to adhere the foil to the glue. 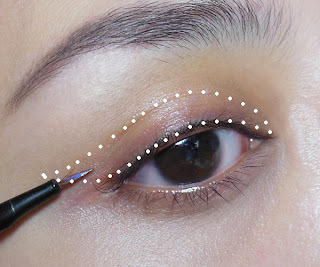 You want to be careful while laying the foil down to go from above and avoid clipping your lashes between the foil and your skin or it will hurt when you rip! Step 3: In a quick but gently move, rip the foil away. Most of the foil ink should have transfered to the glue. If your glue and foil all comes off on the plastic, then you probably needed to wait longer for the glue to set. At this point, you're likely to have some patches where the foil didn't stick properly. You can always dab more glue on those areas, let dry, and then go back in with foil to patch up. Step 4: There will be a bit of a gap between the lashes and the foil, and this is where you go in with black gel liner to fill in. Along the top edges, if there are bits of foil that are sticking out or the edge is uneven, simply use a cotton bud dipped in rubbing alcohol to gently smooth it out just a bit. You won't be able to get the edges completely perfect, so don't worry about it. Step 5: Using a firm, pointed or flat brush and more black liner, run over the top edge of the foil, along the socket line. This creates a defined border and helps you hide any ragged edges. Pull it out along the upper edge of the foil, into a wing. Go back in with a matte black shadow and a softer brush to gently smoke out the line so it isn't too harsh. Step 6: To finish up the eye shape. run more liner along the outer 1/3 of the lower lash line, extending up along the bottoms of the foil wing. For extra drama, I applied a little black to the inner corners for that full cat-eye effect as well but didn't pull the black along the entire lash line, as I didn't want to "close up" the eye. Finish with mascara, and [optional] a little beige or yellow pencil along the lower waterline. 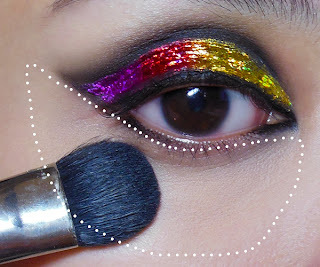 Step 7: At this point, you can finally go in with your concealer to clean up around the black, and the undereye area. Then set with loose powder and you're done! Foils are waterproof and last quite well through the day unless you wet them and rub vigorously. 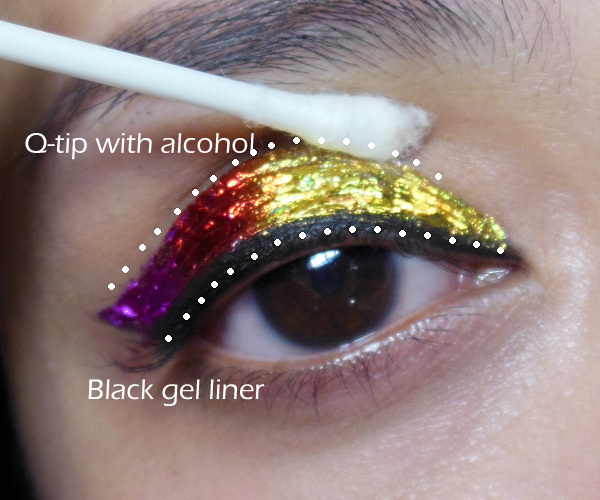 Everyone is going to wonder what the HECK is on your lids every time you blink. Perfect statement-look for a party or the club! Just use regular makeup remover and a cotton pad or napkin to remove your eye makeup. Moisture plus a bit of firm friction will rub it off the same way craft glue or false lashes can be peeled off the skin.